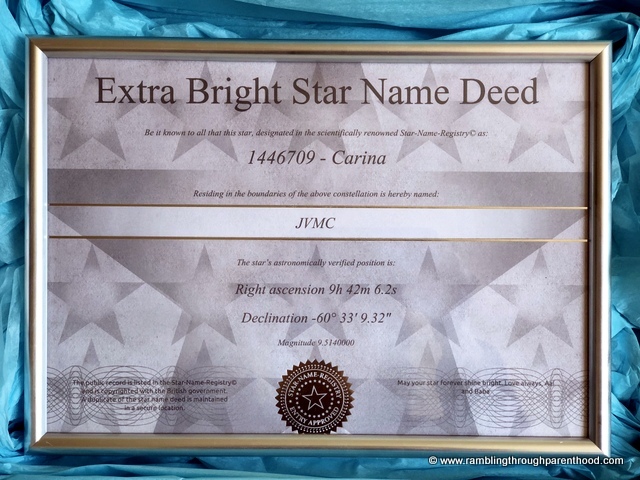 The Star Name Registry is a commercial star naming registry where you can name a star for that special someone. They offer lots of different packages to suit different budgets and styles. Before I tell you more, let me clarify one point. 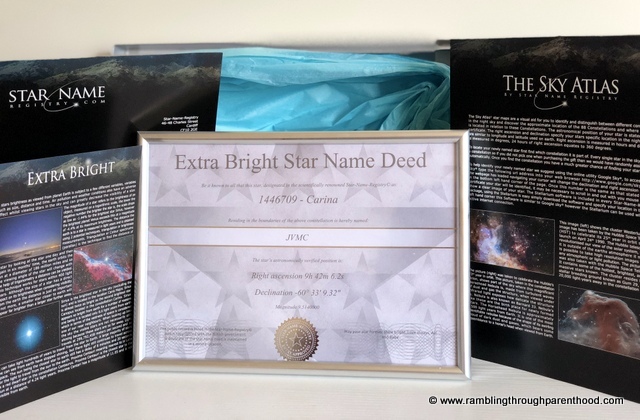 When you name a star, it does not mean you own that star or that the scientific community will forever recognise the star by your chosen name. Star naming doesn’t work like that. What it means is that no star will be named twice in this star name registry. To be fair though, given that there are more stars in the universe than there are people, the odds of the same star being named twice are slim. When you name a star, it’s more about the sentiment than exclusivity. That’s my opinion anyway. Once on the website, I was prompted to choose a name for my star. I could choose a specific constellation for an additional £9.99, or could have one randomly assigned at no extra cost. I could also choose a memorable date and a personalised message to go on the Star Name Deed Certificate as part of the star naming process. The gift set comes with 1 copy of the deed and you can order additional ones by paying a little more. Standard UK delivery is free. I received an email confirming my order and another one to advice me that my Star Set had been dispatched. The gift set arrived carefully packed. 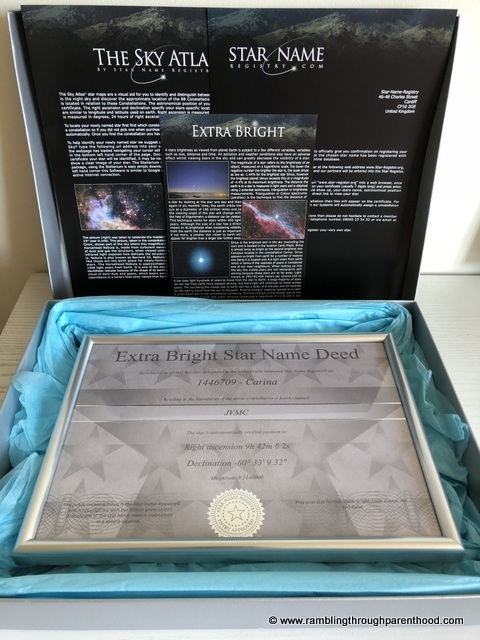 As promised, it included a large silver box lined with blue tissue paper and housing my Star Name Deed in a striking silver frame. The Deed displayed my star name, the constellation in which it was located and its astronomical position. I did not choose a memorable date, but my personalised message was in there, tucked away next to the official silver seal. The accompanying letter confirmed that my star name was now on their register and explained how I could access it online. The Sky Star Atlas offered a description of some 88 constellations and although I haven’t used it yet, promises to help me locate my star in the sky. This one’s a project for warmer weather and clearer skies. You can now win an Extra Bright Star worth £24.99 in my blog competition. This is not a gift set, but you still get to name your own star and receive all these as well. Just fill in the Rafflecopter below to be in with a chance of winning. Good luck! Disclosure: I was gifted an Extra Bright Star Gift Set in exchange for this review. All opinions are my own. I love these :) my dad is a massive space fan and this would be right up his street to mark the significant birthday he has this year!